"Piece of Eight" token, awarded by RandomDSdevel. 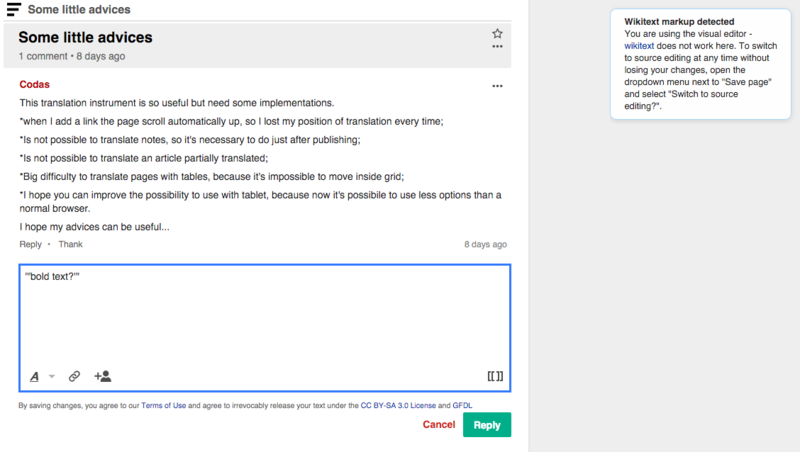 Flow provides support for rich text editing using Visual Editor. As commented in T116417#1756670, some users may still try to type using wikitext. Visual Editor has a mechanism for detecting when users may be typing wikitext, and shows a warning which can help with the issue. However, as illustrated below, in the Flow context these instructions are inaccurate and hard to spot. By showing this warning in a way that is more clear and connected with the next steps we could help users to use the mode they need. For example, a tooltip pointing to the mode switch button with a simple "Trying to use wikitext? Change to source mode" message seems a better solution. 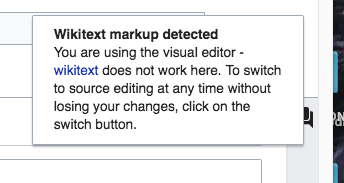 visualeditor-wikitext-warning text appears in VE page editing and also in Flow posts. It mentions UI elements that are relevant in VE page editing, but irrelevant in Flow, so Flow must use another message. Pginer-WMF added a subscriber: Pginer-WMF. Pginer-WMF set Security to None. Quiddity added projects: VisualEditor, I18n. Quiddity added subscribers: DannyH, Mooeypoo, IKhitron and 2 others. Quiddity removed a subscriber: DannyH. Etonkovidova added a subscriber: Etonkovidova.